I loved Kuhlmann’s Armstrong, so was happy to have the chance to read Edison: The Mystery of the Missing Mouse Treasure. I adored it. A little mouse, Pete, wants to find his ancestor’s treasure. The problem is that all the little mouse knows is that his ancestor sailed across the Atlantic and was never heard from again. He asks Professor Mouse to help him and together they find the ship that the mouse sailed on. Unfortunately the boat sank in the middle of the ocean, presumably with the treasure on board. Just like so many other mice, the Professor and Pete are very clever. It requires a lot of experimentation, research and a trip to the museum, but they build a mouse submarine that allows them to get to the bottom of the ocean and retrieve the treasure. They also discover what happened to Pete’s ancestor – don’t worry, he had a happy ending. He was rescued from the ship, just like all the human passengers. The text can be a bit long, depending on the child, but the illustrations and plot make up for it. It’s a cute story and the detailed watercolor and ink illustrations are just gorgeous. Edison is definitely a book I would have added to our collection when Amber was younger. You’ll have to read it to see what the connection to Edison the inventor is though. Torben Kuhlmann was born in 1982 and studied illustration and communications design at the University of Applied Design Hamburg. He finished his studies in 2012 with the picture book Lindbergh – the Tale of a Flying Mouse, which was published shorty afterward by NordSud Verlag, quickly became a bestseller, and has since been translated into more than 20 languages. Kuhlmann has a keen interest in the exciting history of aviation and a passion for science fiction and adventure stories. Looks like it will be very entertaining for children. I love these paintings! 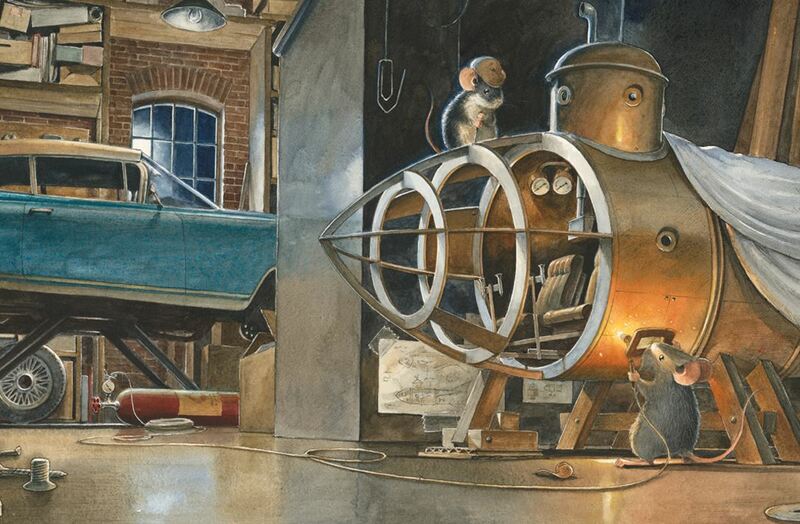 The garage is beautiful, and it is so cute to see mice building a submarine. The illustrations are wonderful – so detailed.